Brushing and flossing are important steps for maintaining clean teeth, and it’s even more important that they’re done correctly. That’s why Dudley the Dinosaur is here to help inform young patients why and how they should brush and floss. This streaming video Dudley Goes to Camp Brush and Floss lays out the basics of brushing as Dudley and his friends attend a camp themed around basic oral hygiene. Teeth should be cleaned every day to ensure protection against caries and other dental health problems. Make sure your young patients know the right way to brush and floss by showing them Dudley Goes to Camp Brush and Floss.It also helps remind them to purchase new toothbrushes, making sure kids are always equipped with an effective tool for the job. Each Dudley video you purchase is instantly accessible through your online ADA e-bookshelf. To learn more about the entire Toothflix video series, visit ADA.org/toothflix. 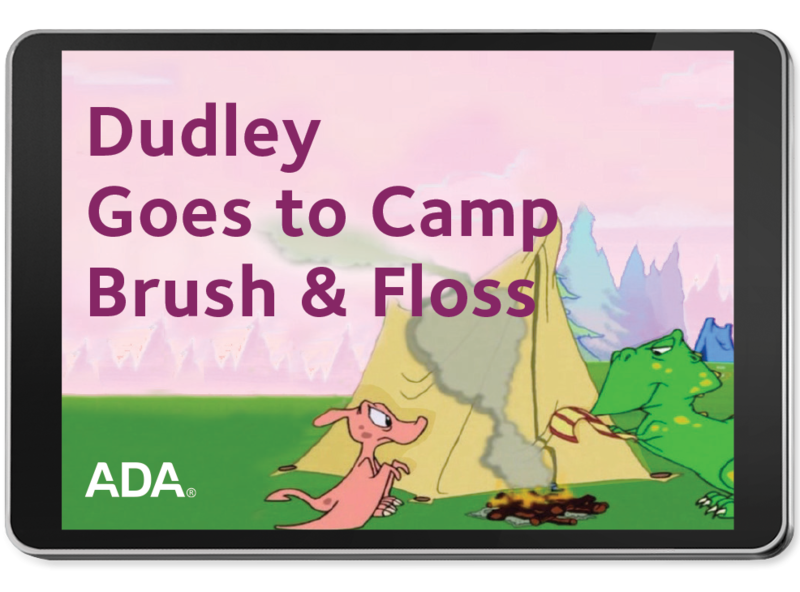 Pick up your copy of Dudley Goes to Camp Brush and Floss – ADA streaming video today!